We thank all our clients for giving us the opportunity to play a small part in your once in a lifetime event. Here are some of the notes and testimonials we have received. We appreciate knowing that you were as happy with your event as we were. It was an absolute pleasure working with you and everyone raved about the flowers and the trees!!! You perfectly captured my vision of what I wanted my flowers to look like and I was just over the moon about how they turned out. I could not of asked for more on my wedding day and am so grateful for your beautiful work. Just a quick note to let you know that the floral arrangements you did for our wedding were perfect – just beautiful. It was a pleasure working with you and I won’t hesitate to refer friends and family to you. Just wanted to send you a huge thank you! The flowers were absolutely gorgeous, and we had so many compliments on them! Thank you so much for the centerpieces, the corsages, the boutonniere’s and the bouquets! The floral arrangements looked so beautiful and made our wedding day even more special. The flowers turned out beautiful and we loved them! You did an amazing job. Thank you! Thank you so much for the lovely bouquet and floral arrangements! We appreciate your coordination on the plants and set up efforts that day! Everything was beautiful and the flowers still are going strong. 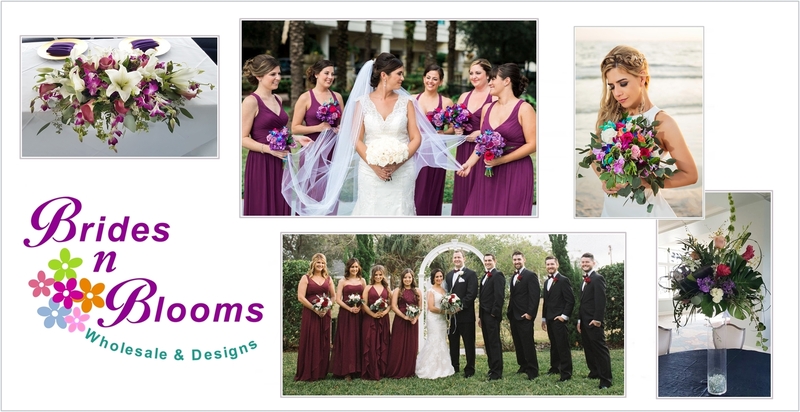 It was a pleasure to work with Brides N Blooms Designs! We can not thank you enough! The flowers were AMAZING!!!! Everyone loved them! Every single arrangement went home with someone be it a grandmother, aunt or family member or our hotel housekeepers who took great care of us! They will be enjoyed all week. I wanted to say thank you so much for the beautiful flowers at our wedding yesterday. Everything was perfect. We just wanted to say a big thank you to Ellen… she helped us so much with not only having beautiful flowers, but also made it easy for us to not break the bank at the same time. Thank you for all your help we greatly appreciate it.. Thank you Brides N Blooms for making our wedding day spectacular and beautiful. Our Chuppah was beautiful and the flower were stunning and perfect. There was not one wilted petal in the whole weekend. We loved it all. Absolute bouquet perfection! What a marvelous day!!! Thank you so much. Ellen, I just wanted to tell you the flowers were beautiful! You did a great job on them! Thank you!. Thank You for the special care you gave us. I love the artistry and the wreath with the photo was very unique. The finished results were beautiful and special for the family. I will recommend you to everyone. We thank you for supplying wonderful flowers, succulents and expertise in setting up the most fantastic tables for Lorinda and Alfredo’s wedding on the Yacht Starship! In spite of the mist and north wind, EVERYONE was smiling and happy. Guests fought over the cigar boxes/succulents! You both were fantastic! Thanks so much! Great job! Jason and I wanted to say thank you for all your hard work and effort into making our wedding look absolutely beautiful!! You did such a great job with everything and the room looked amazing!! The yellow was absolutely stunning against the Tiffany blue and glad we chose that!! Again thanks for all your help and patience with me…I know I asked a million questions, but it looked beautiful! Brides N Blooms was absolutely AMAZING! I got married Oct 2, 2010 on a boat in Clearwater I wanted fall colors to go with the season. We sat and reviewed colors and endless designs. What was great was Ellen, who did my designs, actually took the idea I had in my head and created it. She was one of the few florists who I interviewed who LISTENED to what I wanted. What was even better, she created it! She was a genius.! Dorelle is so knowledgeable about the different kinds of flowers that are available during the fall and the colors they came in. What was great was watching her as she described them. You could feel the passion she has for what she does. Well, on my wedding day, when Ellen and Dorelle brought my flowers, I was stunned. I could not believe how through a simple conversation and explaining what my vision was, these ladies created it. They were gorgeous! Oh! and did I tell you they looked and smelled like they were just picked? Brides N Blooms, I cannot thank you enough for making my wedding day beautiful. Thank You!